You can find beautiful lake homes around the world from Lake Tahoe in Nevada, to Lake Como in Italy. Each house has its own personality and charm that sets it apart from all others. 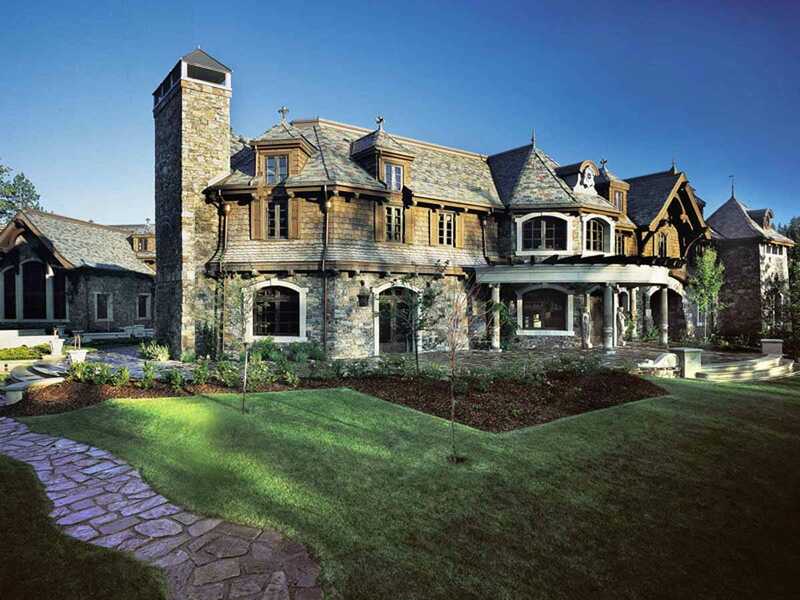 Here is a look at 6 of the most famous lake houses on the planet, some are old, some are new, but they all have their own story to tell and serve as an inspiration for those looking to build or buy their own lake house. You can expect the house of one of the richest men in the world to be extremely large, which is exactly what you get with this Lake Washington estate. The house itself is more than 65,000 square feet of living space, and cost over $60 million to build. At 27,000 square feet, this Lake Tahoe home comes in on the smaller side of palatial lake homes, but is surrounded by some of the best skiing in the world. 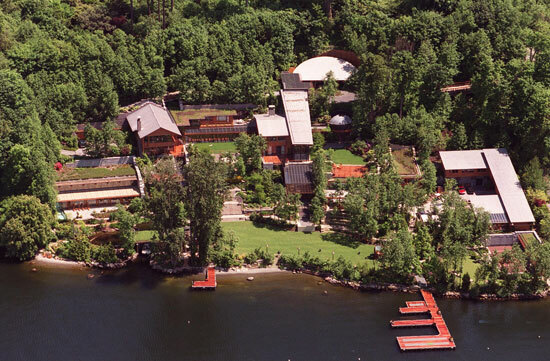 The house sits on 210 acres, making it the largest private residence on the Nevada side of the lake. Additional amenities include 2 golf holes, a guesthouse, and a main staircase, which is based on the original designs for the grand staircase of the ill-fated Titanic. Built in 1882 by Italian businessman Carlo Erba, Villa Erba has been the site of countless weddings and events. Occupying nearly 37 acres of land on one of the most picturesque lakes in Italy gives anyone staying in Villa Erba a good deal of privacy from the sometimes-busy Lake Como shoreline. Movie fans might also recognize the villa from the 2004 movie Ocean’s Twelve, serving as the residence for the movie’s antagonist in several scenes. This 4 bedroom, 10-bathroom house is a perfect getaway if you are looking to stay in the U.S. and enjoy the great outdoors. The manor is located in a very rural part of Wisconsin along the shores of Green Bay, sitting on 80 acres of mostly woodland. The best part of this home may be the extremely large master suite, spanning almost 5,000 square feet and includes 2 bathrooms with dressing rooms, a library, and an elevator. The Villa Balbianello is one of several famous lake houses on the shorelines of Lake Como. The lake has served as a warm getaway since Roman times, which results in the numerous grand houses you can see there today. What makes the Villa Balbianello stand out among so many other famous villas is that it has been used as a backdrop for a number of movies, including Star Wars, and the James Bond hit – Casino Royale. 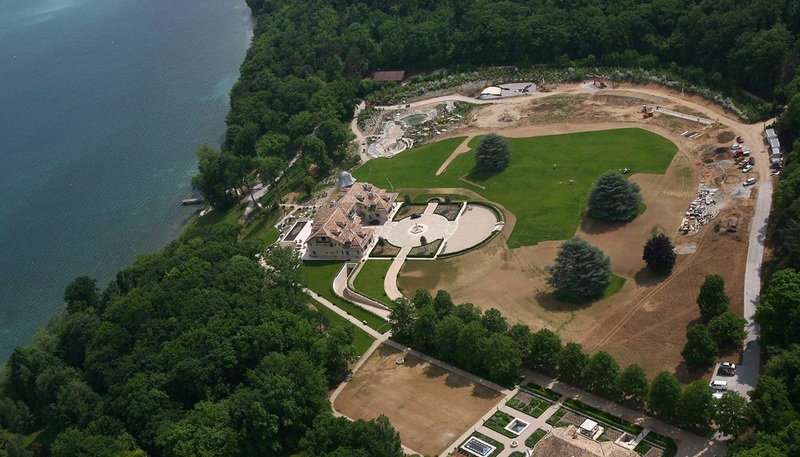 This $35 million mansion is one of the largest homes on one of the most popular lakes in Switzerland: Lake Geneva. The mansion features over 23,000 square feet of living space and includes an indoor swimming pool and over 400 feet of lake shore property. 8 bedrooms is more than plenty for this 7-time F1 world champion race car driver, and the exclusivity of the neighborhood insures that the paparazzi will not be able to sneak in and take pictures of the family uninvited.